René Descartes Slept in an Oven - Fact or Myth? 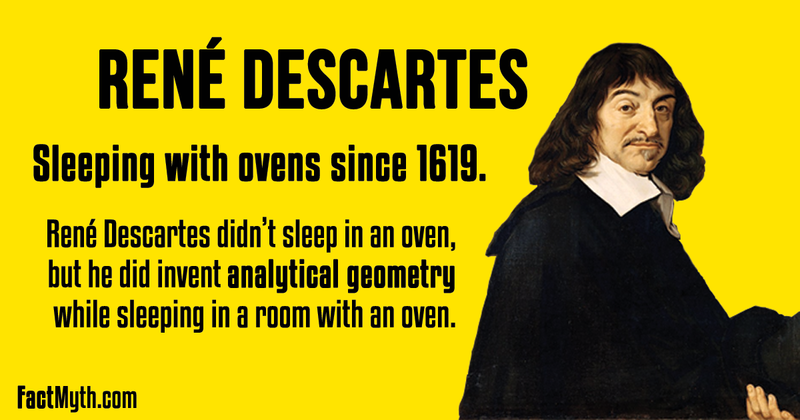 Rene Descartes slept in a oven. Did Descartes Sleep in an Oven? Regardless of how we translate “poêle”, we can be assured he slept in an “oven” heated room, not a literal oven. While we can confirm Descartes invented analytical geometry, and that he likely had his breakthrough as he slept in a room with a masonry heater on a cold November night or two in 1619 (like he eludes in his Discourse and like Adrien Baillet later confirms), the idea that he slept in a literal oven of the type we find in our kitchen is a misunderstanding of Descartes’s terminology. We offer more details on this story below. TIP: If you want the full story, see: Descartes’s Secret Notebook … Chapter 4, page 55 and 56. This short video discusses René Descartes. TIP: In most english translations of Descartes work the term “oven” is fully removed. Likely to avoid confusion. For example, one translation of Discourse says, “I was then in Germany, attracted thither by the wars in that country, which have not yet been brought to a termination; and as I was returning to the army from the coronation of the emperor, the setting in of winter arrested me in a locality where, as I found no society to interest me, and was besides fortunately undisturbed by any cares or passions, I remained the whole day in seclusion, with full opportunity to occupy my attention with my own thoughts.” In French, it is, “J’étois alors en Allemagne, où l’occasion des guerres qui n’y sont pas encore finies m’avoit appelé; et comme je retournois du couronnement de l’empereur vers l’armée, le commencement de l’hiver m’arrêta en un quartier où, ne trouvant aucune conversation qui me divertit, et n’ayant d’ailleurs, par bonheur, aucuns soins ni passions qui me troublassent, je demeurois tout le jour enfermé seul dans un poêle [AKA stove], où j’avois tout le loisir de m’entretenir de mes pensées.” See the French version of Discourse on Method where the term is used. What Does it Mean to Sleep in a Room with an Oven? We cannot say for sure what manner of bed Descartes used, but throughout human history, people have struggled to remain warm during cold weather. There is no way to tell exactly what sort of heated room Descartes enjoyed, but it certainly could have been of this type. That night he was said to have had three visions and believed that a divine spirit revealed to him a new philosophy (analytical geometry). In his visions Descartes was said to have seen very clearly that all truths were linked with one another, so that finding a fundamental truth and proceeding with logic would open the way to all science. Upon exiting the room he was said to have formulated analytical geometry and the idea of applying the mathematical method to philosophy. These inspirations led to his style of rational deductive reasoning, and the philosophies for which he is famous. FACT: Descartes, born in 1596, and was a 23 year old serving as a mercenary in the Thirty Years’ War on the nights of 10-11 November 1619. TIP: Another version of the story has a fly crawling a the clinging of his room. It is hard to say which details of the story are embellished and which are accurate details. Learn more from ualr.edu. Did Descartes Really Invent Analytical Geometry? FACT: Descartes’ Geometry (La Géométrie) was originally published as an appendix to Discourse on the Method. What Else Did the Visions Inspire? The inspiring visions Descartes had while sleeping on that cold night led to the inspiration for his most valued works including Discourse on the Method (1637) which contains the line “Cogito ergo sum” (I think, therefore I am) and his first description of analytical geometry. “… seeing that our senses sometimes deceive us, I was willing to suppose that there existed nothing really such as they presented to us; and because some men err in reasoning, and fall into paralogisms, even on the simplest matters of geometry, I, convinced that I was as open to error as any other, rejected as false all the reasonings I had hitherto taken for demonstrations; and finally, when I considered that the very same thoughts (presentations) which we experience when awake may also be experienced when we are asleep, while there is at that time not one of them true, I supposed that all the objects (presentations) that had ever entered into my mind when awake, had in them no more truth than the illusions of my dreams. Discourse on the Method – where he first describes analytical geometry (the one we discuss here) and details it in the section called La Géométrie. Meditations on First Philosophy – where he gives his take on metaphysics. Principles of Philosophy – where he sums up all previous philosophy and writes Newton’s first law of motion (before Newton), and further explains the mechanics behind “I think therefore I am”. Passions of the Soul – where he describes emotions (largely a work of social science). While René Descartes didn’t sleep in an oven, the fact that he slept in a room heated by an oven is significant. At the time masonry stoves were still a fairly new technology and they heated far more efficiently and consistently than open hearths. René Descartes didn’t sleep in a literal kitchen oven, but he did have a number of visions on that cold winter night sleeping / meditating in a well heated room. These “revelations” led to many of his most important works and great insight into “what we can know” and “how we can know it” (epistemology). Ultimately the story probably says more about the value of sleep and a warm roof over one’s head than it does about sleeping in a literal oven (which is probably worth noting for those aspiring philosophers looking to for insight). “René Descartes“. Wikipedia.org. Retrieved Sep 29, 2015. “History“. cornishmasonrystoves.com. Retrieved Dec 10, 2015.
the French version of Discourse on Method where the term “poêle” is used in Part II (seconde partie). Hard to take seriously an article with constructions like “was said to have saw” and other grammatical mistakes. Good point, this was a very early article. I’ll give it another look. We generally spend a great deal of time researching these, so none should be totally out in left field information-wise.